It would seem that the weather we have been having lately is here to stay a while longer.....until Spring I'm told so I'm guessing with the way our seasons go we probably have another 6 weeks or there abouts!! I think it's fair to say we are all fed up with the rain and the gales......it makes it hard to get excited about the Spring stuff in the shops!! Just as well there are still a few bits & bobs out there for the transitional period!! Lucky for me as I have recently been looking for a replacement for the H&M parka that I bought back in August (featured on my first ever blog post....here). Unfortunately the zip was faulty and it broke beyond repair just after Christmas. I have to take my hat off to H&M and their customer service as they they took it back no qualms even though I had it for some time!! However....this did leave a bit of a hole in the coat collection as it was the only one I owned with a hood.....and boy have we needed a hood of late!! A hood is a must when you have zero chance of keeping an umbrella up in these blustery gusts and as much as I love my beanie.....a soggy hat just does not cut it when it's lashing down!! 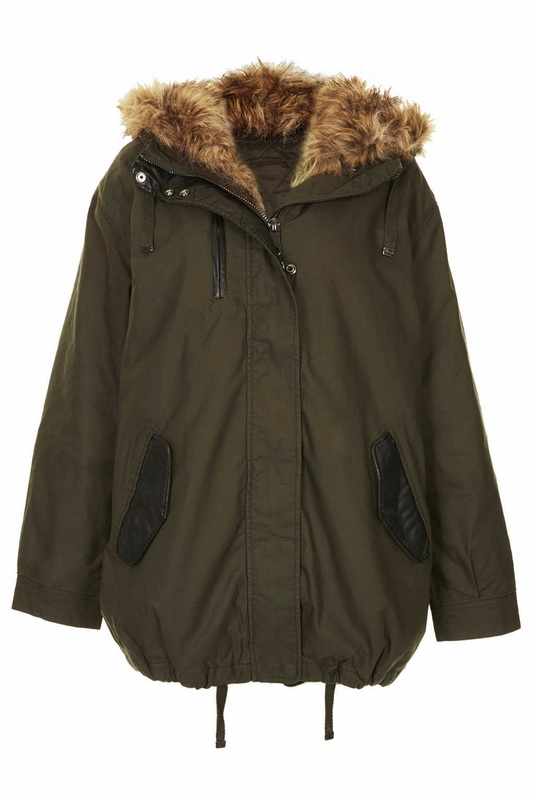 The shopping fairies must have been smiling down on me as I managed to stumble across this Topshop parka in store. It was love at first sight! I did dither....I kept thinking 'isn't it a bit late to be buying another coat??' I do already own a black waxed Whistles parka (sadly no hood though) and I had just about convinced myself I could manage until next Autumn. Especially since the Topshop one was double the price of the original H&M one!! That was until last week when I got caught out in a deluge....then I decided it was time to take action and so I ordered the parka and blimey am I glad I did!! So thrilled with it! It is oversized and there is plenty of room for sweaters and jackets underneath. I love the fur-lined hood....it is really cozy and really pleased with the colour which is a bottle green, nice bit of leather look detailing on it too!! Of course it has already had a couple of outings as the minute it arrived I whipped it out of the packet and wore it straight away! Sign of a great buy! So here I am sporting it!! Happy to report that it has kept me both warm and dry!! Here are the rest of my looks from these past few days. Ahem.....another sneaky little purchase from Pull & Bear in the way of this sweatshirt.....well I did fail Frugal Feb on day 1!! So am I alone in still buying weather led items?! Have you had to dash out to stock up on any clothing essentials to brave the elements?? Or is everybody now head long into planning their Spring must haves?? Hope you are all keeping warm and dry people and that you have been fortunate enough not to suffer any awful circumstances during this weather madness! Love reading your thoughts and responding to them!! It's all in the details Andrea!! The leather look bits and the 'faux fox fur' hood....simply gorgeous even though I do say so myself!! Love your new parka Michelle & with the weather we're currently having (it's actually snowing here as I type!!) I'm sure you're going to get plenty of use from it before Spring arrives!! Great coat and you will wear this again and again and again and again! Love that parka Michelle and I'd say we will easily have 6 weeks more of this weather so it will get lots of use!! There is still time to be buying that puffa coat Sharron.....who would Adam and Eve it that I would still be buying a proper coat in Feb?! It's nuts but a necessity sadly!! Luckily I love ithe new coat which is lucky as i shall probably end up wearing it all year round.....such as the weather conditions are in the UK!! Love it - love the colour and I love the details and I love that you can stuff lots of jumpers on underneath - my kind of parka!